Great way to start off a blog huh. Well one thing turned into the next and through I fought with time to be able to sit down at my computer, I couldn't until now. 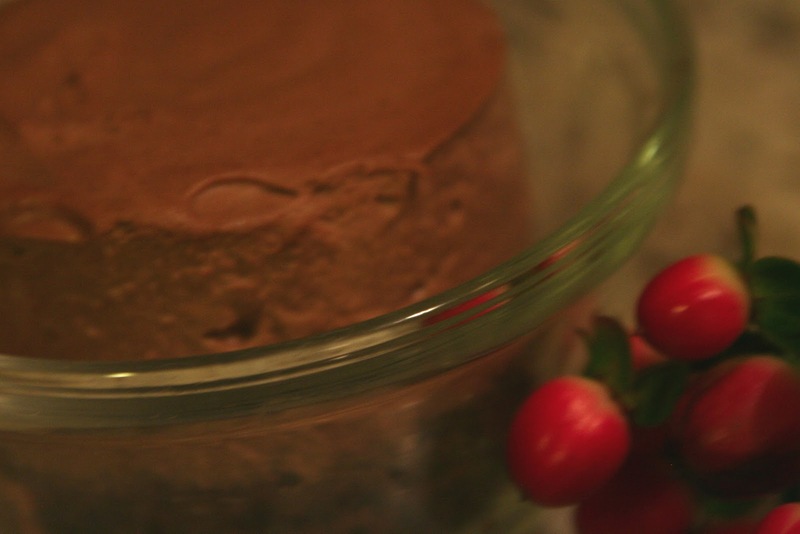 This week's dessert though, is one of my favorites, Triple Chocolate Mousse Cake. It comes from the amazing blog Pasterypal. All cold ingredients should be at room temperature for better incorporation. Preheat oven to 325 degrees F. Melt the chocolate. I like to chop it up fine, and melt it in the microwave in 30-second intervals. Chocolate burns easily, so stir between every zap. Mine took about 60-90 seconds to melt. Keep it to the side for the moment. Using a tabletop or handheld electric mixer, beat the butter, sugar, and cocoa powder together on medium high speed until smooth, creamy and fluffy, about 3 minutes. Add the eggs, one at a time, until each one disappears into the mix. Be sure to scrape down the sides and bottom of the bowl. The dry, gritty stuff wants to collect at the bottom. Don’t let it win. Pour in the melted chocolate. Hopefully, by now your chocolate came down in temperature a little. It should feel like a warm bath. If it’s too hot, it might melt the butter, and that’s no good. If it’s too cold, it might re-solidify into little bits when it hits the cold bowl. So, warm. We want it warm. In a medium bowl, stir together the dry ingredients, which include flour, baking powder, baking soda and salt. Stir ‘em up good. Combine the milk and the water in a microwave-safe cup and microwave them until hot, about 45 seconds. Like a “too hot” bath. Drop the dry ingredients into the mixing bowl and mix on low speed until MOSTLY combined, and then, with the machine still running, pour in the hot water/milk mixture. Be sure to scrape the bottom of the bowl again. The dry ingredients tend to hide there. Pour the batter into a 18″ x 13″ sheet pan that’s been first sprayed with nonstick cooking spray and lined with parchment. (You can use any sized sheet pan with high sides — just pour in enough batter to come about halfway up the sides. If you have leftover batter, you can pour it into greased muffin tins, and bake mini cakes as well.) Spread it out evenly. Cut a cake circle with each ring mold, regardless of which size you’ve decided to use. Place the molds on a parchment-lined sheet pan, one that will fit in your freezer. Make sure your dark chocolate is finely chopped and waiting in a large bowl. Resist the urge to eat the shards. First we’ll rehydrate the gelatin (otherwise known as “bloom” the gelatin.) Sprinkle it evenly over a small bowl with the water. In 5 minutes, it’ll have slurped up the liquid and will look, well, gelatinous. Next heat up the milk to a simmer in a small sauce pan. Stay close so it doesn’t boil all over. Turn OFF the heat (This is important. When subjected to high heat, gelatin deteriorates and turns grainy) and then scrape the gelatin blob into the hot milk. Swirl the pan around until it’s completely dissolved. It’ll look like there’s nothing more than milk. Pour this milk/gelatin concoction over the finely chopped chocolate and let it rest for 2 minutes. The heat from the milk will melt down the chocolate. Whisk it up into a smooth pool of goodness. Set it aside and let it cool to lukewarm. Don’t let it reach room temperature or the gelatin may start to set up. Now, with a clean whisk, whip the cream to soft peaks. This texture is easiest to fold into the chocolate. Scoop about a third of the whipped cream into the chocolate and fold in. Since the chocolate is kind of dense and heavy, this will help lighten it up. When we fold in the rest of the cream, it won’t deflate as much. Scrape the sides and bottom of the bowl as you work, gently turning the mix in on itself. Then add the rest of the whipped cream, and gently fold that in. Pour the mousse into the waiting molds, filling them about halfway, without dripping on the insides of the molds. Otherwise when you’re ready to unmold the finished dessert, the sides will look messy. Put the whole tray in the freezer while you make the white chocolate mousse. The ingredients and method are pretty much the same as the dark chocolate mousse, except there’s less cream to whip. Make sure your white chocolate is finely chopped and waiting in a large bowl. First rehydrate the gelatin. Sprinkle it evenly over a small bowl with the water. In 5 minutes, it’ll have slurped up the liquid and will look, well, gelatinous. Next heat up the milk to a simmer in a small sauce pan. Stay close so it doesn’t boil all over. Turn OFF the heat (This is important. When subjected to high heat, gelatin deteriorates and turns grainy) and then scrape the gelatin blob into the hot milk. Swirl the pan around until it’s completely dissolved. It’ll look like there’s nothing more than milk. Scoop about a third of the whipped cream into the chocolate and fold in. Since the chocolate is kind of dense and heavy, this will help lighten it up. When we fold in the rest of the cream, it won’t deflate as much. Scrape the sides and bottom of the bowl as you work, gently turning the mix in on itself. Then add the rest of the whipped cream, and gently fold that in. It gets poured into the molds, most of the way up. Leave some space on top, about 1/8″ – 1/4″ for the chocolate glaze. Pop the tray back into the freezer while you make the glaze and garnish. Wait until the sauce cools to lukewarm (so it doesn’t melt down the mousse), and carefully pour sauce onto the tops of your molds. It’s going to start setting almost immediately on contact from the cold, so work fast. Back into the freezer they go for at least 4 hours, to fully set. Once set, if you plan to keep them frozen for a while, be sure to wrap the tray very well to keep the cakes from absorbing strange freezer flavors. Melt the chocolate in a medium sized bowl by nuking it in a microwave. Start with 30 seconds, stir, then continue with 20 second intervals until it’s completely melted. Chocolate can scorch easily, so it’s best to do the melting in short spurts. Throw in the cereal, and work it around the bowl until it’s completely coated. There’s something very satisfying about doing this. If some of this mix makes it into your gullet, I’ll look the other way. The day you want to serve them, you can unmold the number you need. They come out of the rings more cleanly when frozen. First, roll them around in the palms of your hands for a minutes. The heat helps release them. Then treat them like a push-pop, and gently press them out. They have a tendency to slip out and land with a thud on your tray, so go slowly. Keep them uncovered in the fridge while they defrost. It probably takes a couple of hours to defrost something of this size. If you made a big cake, you may need another hour or two. Don’t let them sit in the fridge for more than a day. The longer a gelatin-based dessert sits in the fridge, the more rubbery it becomes. Right when you’re ready to serve, warm the chocolate sauce in the microwave for 30 seconds, give it a stir and pour some in your dish. This will be my second time making this, but I have to say, I'm not a fan of white chocolate mousse. So, I decided to make two batches of the dark chocolate mousse. This is one of my favorite mouse recipes, and I think that has to do with the gelatin and the way it helps everything come together. But be careful. Make sure to use a chocolate you really like, because that is exactly how the mouse is going to taste. Otherwise you can add sugar before you fold the chocolate mixture in.